2018 Toyota Prius in Edmonton, Alberta. New & Used Hybrid Vehicles For Sale. Revolutionary design presents itself with the 2018 New Toyota Prius as you engage with adaptive handling and versatile power. Through a sleek exterior design, you are given four-doors that open up to seating for five. 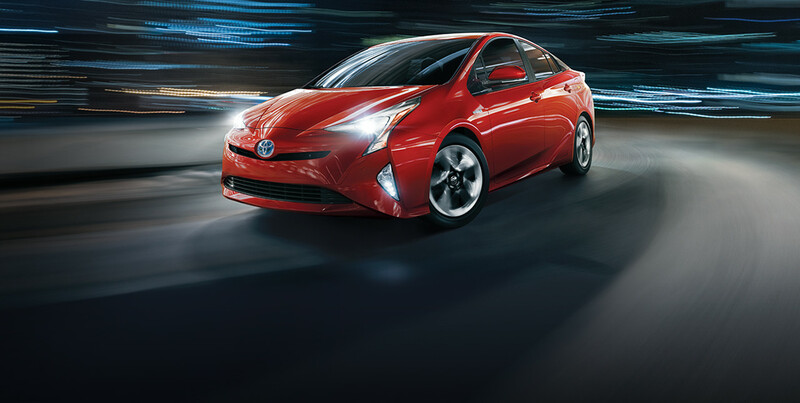 Available trim levels include the Prius, Prius Technology and the Prius Touring. 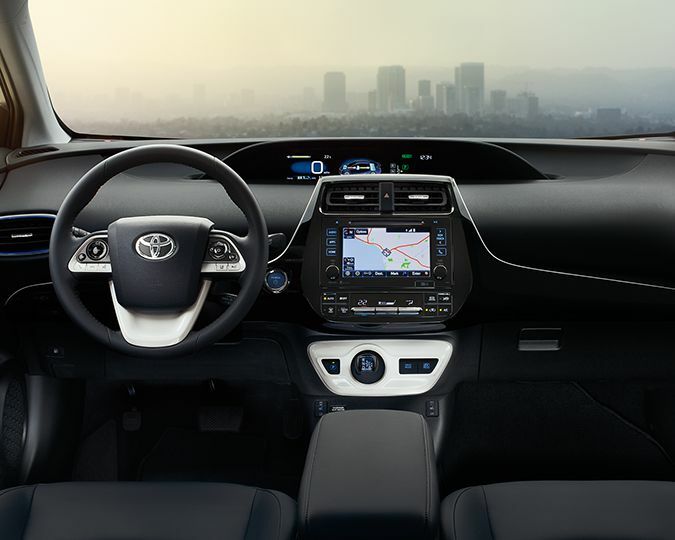 From its smooth interior surfaces to the stark attentiveness that has been poured into every detail, the interior of the 2018 Toyota Prius brings refreshed excitement to the road. Features such as the available illuminated entry heighten elegance as the chrome inside door handles bring a modern touch to the luxury that surrounds. Keep warm during cold winter months as you sit back on the heated front bucket seats with optional SoftTex interior surfaces. Give your hands the celebrity treatment as you grip the available synthetic leather-wrapped steering wheel. 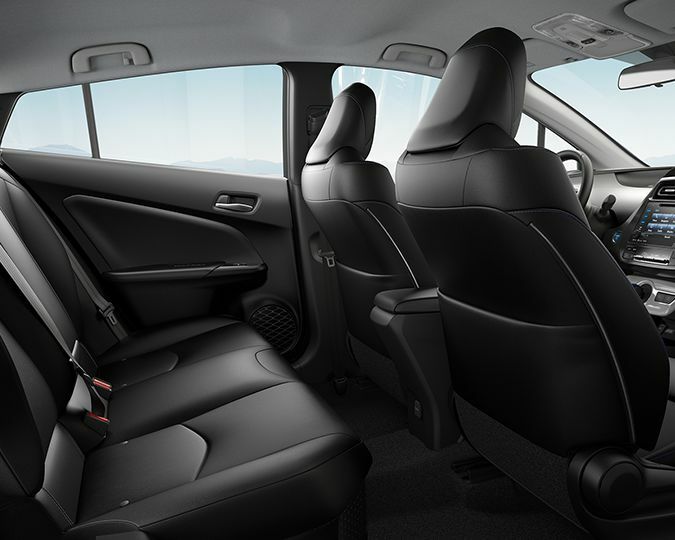 Finding a spot for everything you need is a breeze as you utilize the 60/40 split rear seats. On the outside of the 2018 Toyota Prius, you are given an assertive low slung stance with low rolling-resistance tires a rear spoiler and Prius’s lowest co-efficient of drag ever. Reminding people of the efficiency within are the Hybrid Blue-Accented Emblems as you enjoy fresh air and natural light with the power slide and tilt moonroof. Brighten up the path ahead with help from the LED headlamps, LED Daytime Running Lights, LED rear tail lamps and available fog lamps, expanding visibility in an array of conditions. 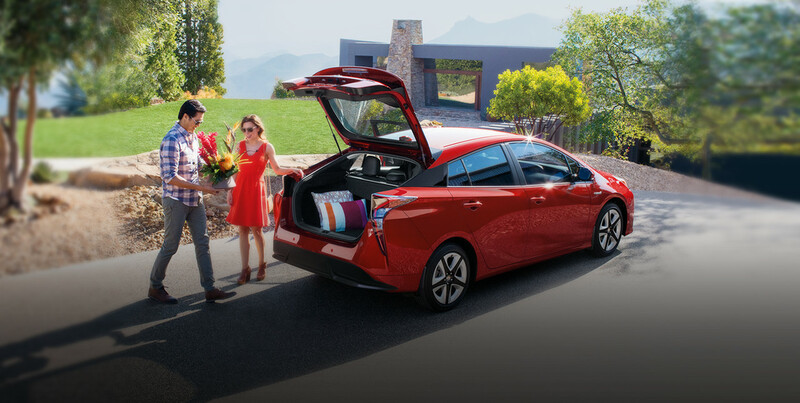 Never compromise focus for connection as you drive the 2018 Toyota Prius and surround yourself with an array of modern communication features that work to keep your eyes on the road. You are given Bluetooth Capability as well as an available 6.1-inch touchscreen to help connect you to your compatible devices for hands-free calling and more. Utilize the available Head-Up Display as you keep your attention on what is in front of you while still being able to access important vehicle information. Keep your charge with optional wireless charging as you simply place your phone on the charging pad and enjoy cord-free power. Make your 2018 Toyota Prius a reflection of your style and preferences as you select from a variety of Genuine Toyota accessories. With the addition of a Toyota Genuine Dash Camera, you are given a safe record of the on-goings of the road so that you can focus straight ahead. Keep your interior fresh and clean with help from the Tub Style All-Season Floor Mats while the option START+ Long Range Remote Engine Starter allows you to start your vehicle from 800 meters or 2,600 feet. Elevate your performance as you drive the modern and efficient 2018 Toyota Prius. Featuring Hybrid Synergy Drive, this vehicle seamlessly transitions between its 1.8L engine and electric motor based on conditions. You are also given the responsiveness of the Continuously Variable Transmission. Take advantage of regenerative braking as this vehicle recaptures excess energy from braking and utilizes it to charge the vehicle battery. Changing the rules as it goes, the 2018 Toyota Prius elevates luxury and performance, while delivering an ideal standard for the everyday commuter. Find your perfect road companion and take on more with ease. The 2018 Toyota Prius is available at your local Edmonton Toyota Dealer – Gateway Toyota. Through a team that is dedicated to your satisfaction, Gateway Toyota is here to help you find exactly what you are looking for.